Irish super-mare Annie Power’s Cheltenham Festival plans have been kept under lock and key by trainer Willie Mullins and owners the Ricci family, but the County Carlow handler dropped a few big clues as to which big race the six-year-old will line up in this March. 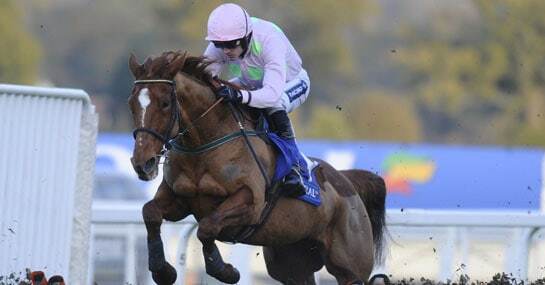 At a pre-festival media day, Mullins stated that “Every time she has gone up in distance over a longer trip it has been good…” when asked about Annie Power, which indicates she won’t drop back to 2m and run in the Champion Hurdle, having already run over four furlongs further this season. Mullins also made mention of the fact that Annie Power has never come up against “a real Champion Hurdle horse”, such as three-time winner and stablemate Hurricane Fly, and “could face five horses that will be hard to beat” if thrown in at the deep end on Cheltenham Tuesday. The Mares Hurdle is another possibility, but it’s difficult to see jockey Ruby Walsh hopping off five-time winner Quevega, who’s another from the Mullins yard, in favour of the Ricci animal. That leaves the Ladbrokes World Hurdle, which Paul Nicholls’ Big Buck’s made his own between 2009-12, with four wins in a row, but the 5/4 favourite for this year’s renewal didn’t look at all fluent around the Prestbury Park obstacles on his first run for over a year back in January. Annie Power is second favourite at 9/4, and now seems just about the right time to steam in at those generous odds, with the Cheltenham Festival picture clearing up considerably less than a month out from National Hunt racing’s showpiece event. The Shirocco chestnut mare has won all 10 of her starts under rules and thrashed last year’s Champion Hurdle fourth Zarkander by 8l in her first ever run at the Gloucestershire track on New Year’s Day. Mullins is the hot favourite at 2/5 to be top trainer at the festival, which looks like a licence to print money considering the mob hand of high-class raiders he’ll bring over from the Emerald Isle.